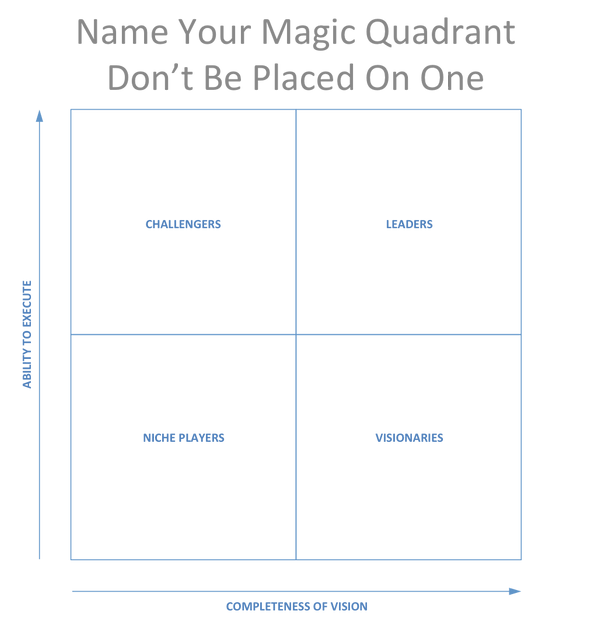 The Gartner Magic Quadrant is the brand name for a series of market research reports published by Gartner Inc. According to Gartner, the Magic Quadrant aims to provide a qualitative analysis into a market and its direction, maturity and participants. In many cases, once the Magic Quadrant is published, and your company is placed into one of those Quadrants, you've missed your opportunity to define your category. As a category designer, the ultimate win is if you create your category, and then the category name ends up being hijacked by Gartner as a Magic Quadrant. Guess who is going to get preferential placement? - Be sure your category name is one that an industry, a market, and an analyst will embrace and be willing to use. Don't have it be so tied to your product and offering that it's only about you. - Even if the industry starts referring to the category as the category name you created, by being first, being a leader and defining the category, you will be associated with it as the category leader. And remember...today’s markets are winner-take-all. The winners - Category Kings - take 76% of their category's economics.